We contracted Basements for less after seeing their work at a friend's house. Dealing with Andre was great, a true professional, never tried to upsell you to do more, and really helped bring our vision life. Adam the general contractor was very good, easy to deal with and very responsive, responded to texts and phone calls very promptly. Overall I would definitely recommend them. The team at basements for less did a superb job renovating our basement. They designed a layout that is functional and spacious. They operated within our budget and in a timely manner, and the results are perfect. Would highly recommend this company. Great work, we were very satisfied with the work for our renos. On time, and met our expectations. They also have some awesome contacts that really made the Reno worth it. Thanks Andrei and Adam. Thank you Basements for Less for completing our beautiful basement. Andrei, Adam and their entire team were respectful, hardworking and accommodating. They promptly addressed all of our ongoing questions, concerns and visions. We love our newly finished basement including a 3 piece washroom and laundry room. The tiling of our stone wall, washroom shower and floor is beautiful. We have and will recommend them to others for their home renovation needs. The Basements for Less team did an amazing job on our space.Andrei was very easy to work with.Clear and responsive communication and great service!The crew were very professional,polite and clean.Quality work and beautiful finish.Couldn't have hoped for a better result. Thank you HomeStars, I am so glad I found Basements For Less through your website! My husband and I decided to finish our basement in November but were very worried about who we can trust to do the job right and on time. We took a chance called Andrei he came over and gave us a quote right away, he was professional and straight forward we were impressed with his quote, we signed up almost immediately. His team started promptly after that, and the project went on very well. His team was clean, courteous, came in did their work every day and were overseen by Adam and the great thing is that he was always around if we had questions or concerns. The great thing is that I could reach Andrei or Adam anytime day, evening, or on weekends too, they didn’t mind they always responded and this was very important for me.! As promised, the whole basement (1 shower/washroom, kitchen, bar and sitting area) were completed on time and beautifully! I was amazed at how they worked together, the whole project was well planned and managed by Andrei and Adam like clockwork, they worked very well together. I want to thank them for being trustworthy, and to their word. I am happy with my basement now and can’t get enough of spending my family time there. Thank you for a wonderful job well done! I RECOMMEND Basements For Less, try them, get a quote, you won’t be disappointed they do excellent work! Thanks so much for the incredibly kind words, Lodi. We're grateful you had chosen us and it was a pleasure working with you on your project. 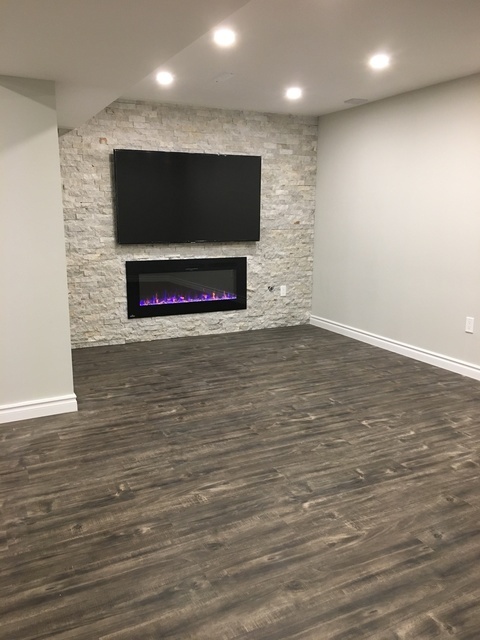 Found Basements For Less on Instagram and after seeing some of their work and reading about others experiences, we decided to contact them for an estimate for our basement reno and we're very happy we did. Not only was the project completed within the scheduled time frame but it turned out beautifully. Andrei has been in business for some time and it's evident in his project management skills, communication in how easy it was to get answers to many of our questions before and during the process. The crew was courteous and clean and always took great attention in keeping the work area clean. My wife and I are very happy and can't wait to enjoy our new space! We needed to get our basement finished and found that many had good things to say about Basements For Less as well as Andrei and his men. From the first call, Andrei was very easy to speak with and had good and practical input for our space. The work was done with quality, the tradesmen were professional and our basement turned out a success. We're very happy with the end result and would definitely recommend Basements For Less. Thank you Basements for Less for finishing our basement. We LOVE how it turned out! Adam and his team worked hard to complete the basement before the Christmas holidays for us. Adam and his team worked quickly and not only completed the job on time but completed it well. They were very easy to work with as Andrei and Adam were prompt in returning any messages or dealing with any concerns that we had. Andrei was on time for every appointment we had with him and when choosing our finishing touches like flooring and cabinets, he had many options and samples to choose from. He was very accommodating when we changed our minds on our flooring and granite countertops and continued to come back to our house with samples until we reached a final decision. We know we will be enjoying this basement for many years to come and look forward to working with Andrei, Adam and his team again. I was very pleased with the end result of my kitchen reno done by Basements For Less. Project management by Andrei, the owner was great and it was very easy to communicate with him. Quality of work was of very high standard and so was the teams attention to detail. The entire process went very smoothly from the initial in-home quote through to the final finish. Highly recommend Andrei and his team to our friends and family for any of their home improvement needs. Welcome to Basements For Less.Specializing in completed and fully finished basements, bathrooms and kitchens. We pride ourselves in exceptional quality with the lowest price.